The inventor tinkering in a garage and coming up with a better mousetrap is a cherished American image. These days, that tinkering is likely to take place at a sophisticated computer or high-powered microscope. But no matter how they do their work, scientists continue to come up with ingenious and useful advances. Here are a few gee-whiz breakthroughs that are already helping us, or soon will. Even rock stars seem to be paying a new kind of attention to women. Steven Tyler, 60, (lead singer of Aerosmith! Liv's dad!) is in Sturgis exhibiting his new line of custom bikes. "It's not a macho motorcycle, and it doesn't have to be lowered for women," he said. As to how Tyler continues to rock well into his AARP years, he related, "If there's one thing we've learned, it's that you don't get to be this age by being a fool." For me, not being a fool has pretty much meant staying off motorcycles. It seems it's taken a rock star to get me on one. But of course, it wasn't moving. After more than 25 years and 25 million deaths, the world has yet to realize that HIV isn't just a man's problem. Although it has escaped the notice of most media -- and even many in the health care and health policy fields -- HIV has quietly become the third most-deadly disease for women in the United States, behind only cancer and heart disease. It's also the leading cause of death for African-American women between the ages of 25 and 34. Elinor Nauen is experienced and proficient in both traditional and new media as a writer and editor. She has worked in magazine and book publishing for 25 years, starting as a copy editor at Woman’s World Weekly, and along the way serving as a fiction, travel and senior features editor for First and Woman’s World. She has edited books by Senator George Mitchell, Paul Krassner and Danny Schechter, among others, and edited for Seven Stories, Kodansha and other presses. She served as acting editor-in-chief of MediZine Healthy Living, special health sections editor for Newsweek and executive editor of Gender & Health, a publication of the Partnership for Women’s Health at Columbia University. Elinor has written on health topics for Family Circle, Fitness, Self, TheBody.com, InsideMS, The Saturday Evening Post and Health. She has written on automobiles and the driving experience for WE, AARP’s My Generation (where she was the automotive columnist), AARP.org, Cachet, Health, New American Writing and many other publications; and on sports topics for Cult Baseball Players, Elysian Fields Quarterly, Aethlon, Sports Illustrated for Women, Nine, America, Up Late: American Poetry Since 1970, National Endowment for the Humanities Magazine, Hollywood Review, American Book Review and many other magazines and anthologies. She has also published in such magazines as Organic Style, Hallmark and Weight Watchers. Her books include My Marriage A to Z, So Late into the Night, CARS & Other Poems, American Guys and, as editor, Ladies, Start Your Engines: Women writers on cars & the road (Faber & Faber, 1997) and Diamonds Are a Girl’s Best Friend: Women writers on baseball (Faber & Faber, 1994). 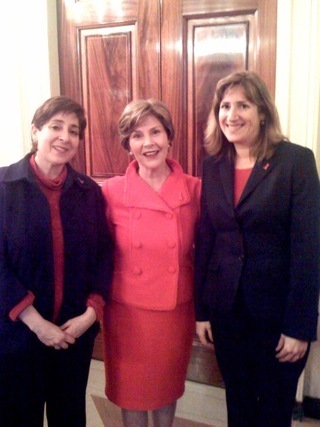 Me, Laura Bush & my sister Varda at a White House reception in February 2008 for the Heart Truth. Wearing red was de rigeur. Note Varda pretending to tower over me.